FretX is the new device that uses lights to help you learn to play the guitar. But is it worth it or is it just a gimmick? FretX has gained quite a lot of attention on social media with opinion seeming to be split on whether it is a good thing or not. The belief of the French company behind FretX is that learning the guitar can be made more playful without the need of music notations or tablature. The concept is actually quite simple. However, although simple it has taken a lot of development to get to the final product. Over a year and a half in development and numerous prototypes created and tested before the creators were happy to release the final FretX product. 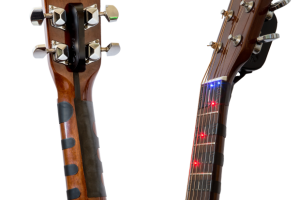 FretX is a device that you fix onto the fretboard of your guitar and works by the use of little LEDS which shine indicating where you need to put your fingers. By following the lights you are able to more rapidly learn chords, scales and songs. Or at least that is the claim of the creators of FretX. 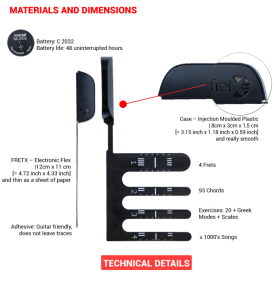 The technical details behind the FretX. As we said above the device is very simple. You slide it onto the neck of your guitar and secure it in place with the neat tabs. It fits any six string guitar, electric or acoustic, steel string or nylon. As with anything these days you have to download an app, the FretX app, and then it is a simple case of following the lights. You can select different chords from the app, a signal will then be sent to the LEDS which will light up to show you where to place your fingers. The good thing about the FretX is that it is fitted with sound detection technology so your performance is monitored and you are provided with immediate feedback on your performance. FretX has been launched via the crowdfunding platform Indiegogo and the company hope to raise $50,000. So far they have managed $43,000 so are well on the way to meet their target. On social media the reception has been fairly mixed. Some see the value of the device where as others just can’t see the benefit. For me we all learn differently and any device that helps to make learning easier and more fun is a good thing. However, there is a drawback in that the FretX only covers the first four frets of the guitar. Great for learning all the basic open chords but limiting if you want to learn what happens on the upper frets. To see how FretX works check out the video below. To find out more about FretX it is worth visiting Indiegogo. I have been waiting over 18 months for this product and have received nothing but excuses. A TOTAL SCAM………….yes, I do have all of the mails and messages to prove it. It is disappointing that you have had this experience with FretX. We had a very mixed view on the device as we were not sure it would give the benefits the inventors claimed. But it is even worse if they are not even delivering a product to their customers.